muslim men spying on churches – welcome! my colleagues, joachim and stanley had lodged a police report against the publisher of the magazine, al-islam. refering to the may issue of the magazine, two muslim men had gone undercover to a church with the aim of seeking out malay youth who apostate. they also held a press conference at the police station itself. they went to attend the mass in church from beginning to end and participated in everything… including holy communion (the consumption of ‘the body of christ’), which is only for catholics. to us catholics, the body of christ is something very sacred, that only catholics (some churches even stressed ‘baptised and practising catholics’) are allowed to consume because only we catholics believe in this what was called ‘transubstantiation’ where a piece of white host was transformed into the body of christ. as the police report stated – ‘this white host, according to the catholics, is something very sacred and should not be played around with because catholics believe the host to be jesus christ, whom only catholics can consumed’. those two undercover muslim men not only consume the body of christ but they spit it out later to photograph it (this means earlier they didn’t consume it but hid it in their mouth). please read the report here. i also attached here the said article in al-islam regarding these two men going undercover. (here and here – please enlarge it to read. if you find it too small to read, contact me, i’ll email them to you). it was indeed terrible what they did. it won’t be so bad if they just attended mass and sat there and watch… but they went to consume the body of christ, spit it out and take photo of it! this is really ‘hina’ to our religion. to us the ‘roti putih’ is jesus himself where nobody should not main-main with it, least of all, non catholics. there is another article in the same issue of al-islam which talked further about ‘remaja melayu murtad’ (malay youth apostate). they seemed to blame the church for trying to convert the youth. i find that strange. first of all, the church would never do that (and to think they even said a church pay the youth to convert!) and secondly, more importantly, if the youth feel like converting, it’s their own business and if they want to blame someone, why blame the church? why don’t they blame the youth? better still, blame themselves!! why the youth wants to murtad? probably they did not guide the youth well enough in their faith!! it’s same like the allah issue (btw, it was mentioned in the article too), where those religious officers keep saying if the church use ‘allah’, it will confuse the malay youth. come on, don’t insult the malay youth i’m sure they won’t be so easily confused. if they are, who is to blame? same like, if they feel many malay youth murtad – converting to christianity (or other religion) who is to blame? 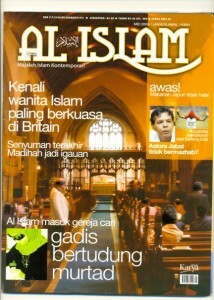 note: i have two other articles from al-islam too which touch on those muslim men spying on other churches. if you wish to have it, do email me. UPDATED: on second thought, here are the articles. article 1, article 2, article 3.
click on ‘read the rest of the entry’ to read the press release. We are deeply concerned that two Muslim men acting on false information that the Catholic Church was converting Muslims into Christians had recently entered a Catholic Church service for the purpose of gathering information as to whether this was occurring. 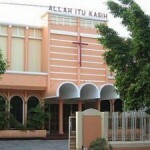 They were also investigating whether the word ‘Allah’ was being used in church services. These men participated in the church service and even took part in the rituals that are strictly for Catholics and in doing so violated the sanctity of what Catholics hold very sacred. These men later wrote about their experience in an article entitled “Tinjaun Al Islam Dalam Gereja:Mencari Kesahihan Remaja Murtad” which was published in the May 2009 issue or the Al Islam magazine. The men had consumed the ‘communion’ which is a white wafer which is blessed by the Priest in a Catholic ritual that dates back 2000 years. Via this ritual the ‘white wafer’ is supernaturally transformed into what Catholics believe to be Jesus Christ and when consumed allows Catholics to experience life after death. The ‘communion’ is held with great reverence and cannot in any way be mishandled or with a lack of respect. Even Catholics are not allowed to take home the ‘communion’ but are instructed to consume it immediately during the service. Catholics go through an elaborate process of preparing themselves to receive this ‘communion’ worthily and those who have not done so are advised to refrain from receiving it. As such we are outraged that these Muslim men consumed it only to spit it out later, have it photographed and have its image published in the Al-Islam magazine. The total disrespect shown to what Catholics hold in closest to their hearts and believe to be most Holy strikes deep into our hearts and invokes much anger. While we are resolved not to allow anger to guide our actions and instead pray that these ignorant will be forgiven by the Allah, we want to know what has become of this most holy ‘communion’ and demand its immediate return to the church authorities. We are further outraged that these Muslim men have violated our sense of privacy to freely worship. Would these men tolerate non-Muslims entering the mosque and violating the sanctity and holiness of their worship? We believe that all places of worship and the form of worship practiced in these places must be respected with the greatest sensitivity and reverence be they the church, mosque, temple or gurdwaras. Entering these premises with the intention to spy and worse to violate the sanctity of the worship only serves to incite anger and hatred that could lead to potentially dangerous consequences that would tear this country apart. As such, as concerned Catholics, we have made a police report at the Patani Road Police station on 8th July 2009 and thereafter held a press conference at the same place. We requested that the police investigate this matter with great urgency and bring to books those responsible for acting to incite hate and resentment among the Catholic Community. We also call on the police to investigate both the Al-Islam magazine and the writers of the article. 18 Responses to "muslim men spying on churches"
whatever our churches are, be it catholic, protestants or evangelical, our mission remains the same that is to seek and to know Christ our Lord and saviour. we all must stand united and strong against whatever challenges from the other side which is all out to discredit and find faults in our belief or religion. Keep on praying and leave it to our living God to show those concerned the truth and the straight path to Heaven. I hope and pray that the two non christians who entered the church illegally would be touched by Jesus Christ and become Christian one day. I’m really concerned about what’s been happening these past few years in this beautiful country where intolerance, disrespect and distrust has grown to such a degree that such despicable acts of sacrilege and irreverence in a Catholic Christian church by certain individuals who were misinformed and brainwashed by a religious group who is getting very paranoid and insecure about their believers apostasizing. They should point the fingers at themselves and not at others and see where they have gone wrong. I wonder what will happen if it was the other way round. It is very disturbing to even think about it. What is Polis Raja di Malaysia (PRDM) and the leader of 1blackMalaysia doing about it?